The highest Capital city in the world is La Paz in Bolivia, at 4,000 metres. The possibility of altitude sickness is very real: headaches, dizziness, sickness. At every altitude the bird species change. At the summit there is a humming bird which can only survive in this rare atmosphers. It is almost as large as a small falcon, and appropriately enough, is called the Giant Hummingbird. In Bolivia my travels took me to an astonishing project. At Villa Turani, a rehabilitation centre has been set up for abused birds and animals, with a particular stroke of genius. . . the abused animals are nursed back to health by street children who themselves have been abused. It's a strange sight. There are parrots and macaws which have been kept in the tiniest of cages. These are intelligent birds, and in their misery, unable to fly, they begin to self-harm. There are a variety of monkeys, also kept in tiny cages, which have also self-harmed. They are taken to the centre after having been redeemed by a sum of money, or by owners who are weary of their illness, and have no idea how to tend them properly. In Villa Turani, very slowly and with great delicacy, the animals begin to trust again. Some are too damaged, psychologically, to attain normality. The feathers of some birds will never regrow to the gorgeous greens, reds and yellows we associate with the parrot family. The children, in their turn, learn to trust again. The bond of affection between the children and the creatures they care for, is very touching. At every street intersection in La Paz, there are childern waiting to sell shoelaces, chewing gum and cigarettes to passing traffic. Many of them sniff glue quite openly, and in their ecstacy bite and chew at their fingers, often down to the stumps. They huddle together at night in doorways, dressed in the filthiest rags. Among them are children as young as 3 years of age. It's a pitiable sight, and draws tears from foreigners unused to the sight. They live in constant danger from Police and Paramilitaries who treat them as vermin. They fall prey to pimps and drug traffickers. Some are lucky enough to be rescued by Christian charities, where they are properly loved and cared for. It was a Christian woman who conceived of the idea at Villa Turani. If the Lord could rebuke those who had little time for the young, she felt called to protect the most vulnerable. There's a Garden of Eden quality in Villa Turani: there are mokeys in every tree, most of them very tame. There are Macaws and parrots of all types, approaching visitors quite fearlessly, and feeding from human hands. Children learn to smile again, to look forward to a future away from gangs and drugs. That people should live in harmony with each othwer and with his creation. . . .surely this is what God always intended. 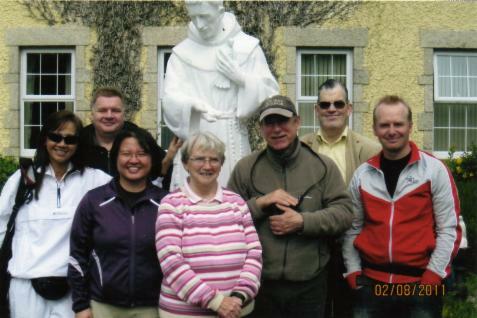 In August of this year (2011), 7 parishioners from St Francis travelled to Lough Derg for the hardest Pilgrimage on the circuit: a 3 day stay of prayer and fasting on a tiny island in Donegal. The format is very simple: pilgrims are taken to the island by boat, and on arrival divest themselves of their socks and shoes. Cameras are strictly forbidden, as are mobile phones. We joined 300 people, including a large contingent from France. Two meals are served every day: toast with tea and coffee. The first evening pilgrims stay awake all night, walking around the church during the devotions. Physically this is very demanding, and we were encouraged to gently stir each other out of sleep whenever we succumbed to slumber. Any pilgims who thought they could retire to the dormitories for a quick nap found the doors locked. Through library windows a number of easy chairs looked very tantalising in the wee small hours, but these doors, too, were locked during the vigil. During the night, each station lasted around an hour, with a 10-minute interval during which we were permitted to drink St Patrick's soup: hot water, with salt and pepper! And after the vigil, there was morning Mass. Then the stations continued immediately, and lasted thoughout the day. We slept in dormitories for the second night in bunk beds. Each Station involved prayers said around the cells of monks who had lived on the Island some 1,000 years peviously, kneeling on the remaining stones of their cells for each prayer. And yet, the simple formula was strangely powerful . . . the endless murmur of quietly uttered prayers, prayers learnt at our mother's knees: Our Father, Hail Mary, Creed, not much more than that. There were no charismatic utterances, no seminars or faith-sharing. These have their place, but not here. Above all, a lovely light humour and good heartenness pervaded eveything. Perhaps the mystery of its success is summarised in the opening payer: each pilgrim stands before an ancient Celtic coss, with ams outstretched, and utters 3 times: I reject the devil, the world and the flesh. All the pilgrims want to return. We met Fr Seumas, on his 40th Pilgrimage. He told us he was there to suffer in solidarity for the people starving in the Horn of Africa. Others were there to pray for their children. Around 10 Priests on the Pilgrimage had the pivilege of hearing confessions, and we wept gently with pilgrims as we heard their tales of suffering. There seem to be so many people with no-one else in whom they can confide. Thee are also day-retreats, and a good selection of youth events, where young people share their faith with each other. I’m standing in a boggy march, ill clad and wet through. My guide is a young man of 24years, a graduate in Ecology. I keep forgetting his name! “ It’’s Baino”, he says. “ Just thing of the first two syllables of the word Binoculars, and that’s it”. Suddenly, in the distance, wet and shivering in a marsh, we hear the most mournful of cries, haunting and poignant. We scan the skies for the author of this sad sound. It’s unbelievable: a fly past of 9 Siberian Cranes, in perfect echelon. Baino has never seen these before, and whoops with pleasure. These are on the list of critically endangered species ( C.E.S ). There are 4,500 birds in this particular population, and there are fears that these stately birds will become extinct. Their haunting cry goes straight to the heart. They seem to be saying: S.O.S.”Save our Species, Save our Species”. Baino, with a driver Batta, has met me at the airport in Ulan Bator, the capital city of Outer Mongolia. For the next 8 days we drove in a 4-wheel drive jeep and slept in Yurts, tented structures with no toilet or electricity. In the night it’s bitterly cold. I sleep fully dressed, with several layers of blankets, but that’s barely enough. It’s also pitch black, and when I leave the Yurt to try to see what the time is, a futile gesture, and wander off a little in the dark, I can’t find my way back. I do stumble upon a Yurk, but it’s the wrong one! The interior is lit by a candle. Startled eyes look up. With my pale features. I must have looked like the Yeti. On our journey of 1200 kilometres, we cross numerous streams, see packs of wild Przewalski horses, double-humped camels, yaks and horned sheep. Most of all we see 102 different bird species, twenty nine of them lifers. No, a lifer isn’t someone in prison till they drop dead! It’s a species of bird seen by the observer for the first time. At the end of the journey, I visit the Catholic Church of St Peter and Paul in Ulan Bator. The Priest, Father Herve, comes from Cameroon in West Africa. He is trained as a professional musician and teaches dance. This is an infant church, with 60 people attending Sunday Mass. He has one or 2 converts every year, no more, and I meet one of them, Peter,an I.T. specialist. Why did Peter become a Catholic? He always wanted to learn the piano, and was told that the church next door taught lessons free of charge! He wanted to learn English, and was taught by Fr. Herve. After 2 years instruction, he became a Catholic, he sings in the choir and is the I.T. man for the church. Most memorable moment: A nomad family invite us into their yurt to drink fermented mare’s milk. The beverage is 2% alcohol and is a new experience to my taste buds. They prepare some food for us. The fire is lit with cattle dung, and the same hands prepare a mix of cheese and strips of dried meat. These are kindly people and any show of disgust is a great insult. I was reminded of Abraham’s visit to his tent by three divine persons: we entertain angels when we give hospitality to strangers. One freezing morning, warming ourselves with mugs of steaming coffee, I meet two scientists from Lafayette University. They record all the sounds from a particular area: the buzzing of bees, the bird-song, the barking of deer, the chirrup of insects, etc. Next year the same exercise will pinpoint any species that are missing. The loss of a single species ultimately indicates the health of the planet. I ask if they have ever recorded the flutter of angels wings! By now they’ve guessed I’m a Priest. The Professor volunteers some information: He was an altar boy, and loved the thurible, the heaps of incense, and clouds of smoke. Now he’s lapsed, but hopes to return to the practice of his faith. I met some clever people. Baino was doing a Masters Degree on the impact of wind farms on bird-mortality. Large birds which migrate at night can be literally chopped to pieces. That night I have a dream. Baino is showing me a photograph of the carnage: Swans, Geese and Cranes lie dead beneath the blades. As he condemns this slaughter, and pleads for other energy technology, I imagine someone listening intently, and nodding in agreement. In my dream, he comes closer. Who can it be? The hair, surely, gives it away. It must be Donald Trump.